Project ideas, articles, best practices, and assessment strategies from educators at the forefront of making and experiential education. 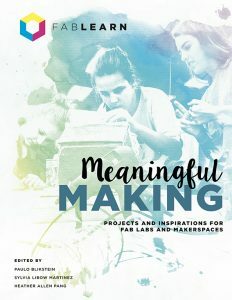 Meaningful Making books are available for free as a downloadable PDF, or in print at major online retailers including Amazon.com. Proceeds of the print edition will be used to fund FabLearn Fellow activities. A learning revolution is in the making around the world. Enthusiastic educators are using the new tools and technology of the maker movement to give children authentic learning experiences beyond textbooks and tests. The Columbia University FabLearn Fellows are a group of K­­–12 educators working at the forefront of this movement in all corners of the globe. They teach in Fab Labs, makerspaces, classrooms, libraries, community centers, and museums—all with the goal of making learning more meaningful in the modern world. 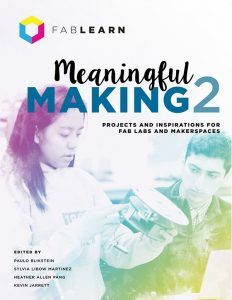 In these two volumes, FabLearn Fellows share inspirational ideas from their learning spaces, assessment strategies and recommended projects across a broad range of age levels. Illustrated with color photos of real student work, the Fellows take you on a tour of the future of learning, where children make sense of the world by making things that matter to them and their communities. To read this book is to rediscover learning as it could be and should be—a joyous, mindful exploration of the world, where the ultimate discovery is the potential of every child. Contact us for volume and bookstore orders or to use a Purchase Order (for quantities of 10 or more). Print versions are available from Amazon.com, Barnes&Noble, and major online retailers worldwide.